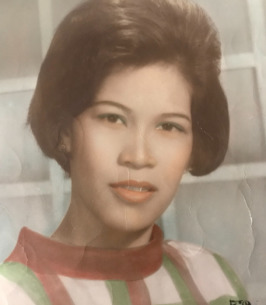 Mirnalon Macaspac "Merla" Andrada, 77, passed away on December 6, 2018 in Honolulu, HI. She is survived by Sons-Yule, Robert, Charlie, Warner, son in laws Toby, Lino, Daughters, Mary Ann, Maribel, daughter in laws, Toni, Perla, Evelyn, Olin and Cynthia. Grandchildren-June Ann, J-Boy, Johanne, Karlo, Thor, Raf, Nic, Abby, Alexis, Ulysses, Blaze, Jobert & Jenny, great grandchildren Brandon & Karson. Celebration of Life services will be held on Friday December 28, 2018 at Ballard Family Moanalua Mortuary. Visitation is at 5:00 pm, services at 6:00 pm. Casual attire. To send flowers to the family of Mirnalon Macaspac "Merla" Andrada (Macaspac), please visit our Heartfelt Sympathies Store.